Recall from previous lessons that each route has decision points: “macro” at the base of a route, “mini” at stances with protection, and “micro” at stances without protection. At each point, you go through a complete cycle of preparation-to-action, shifting crisply from thinking to doing. For redpoint climbing, your macro preparation will include getting on the route, identifying mini and micro decision points, testing fall consequences, and working sequences. Once you have finished thorough preparation, you are ready to take action with a redpoint effort. For on-sights, your macro preparation will involve gathering whatever information you can from the base of the route. 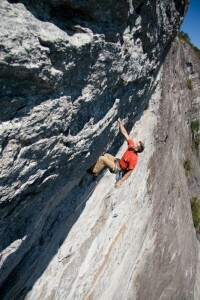 In preparation, you use the preparation process to create your plan for climbing. If you are making a redpoint effort, on a route you have thoroughly worked, this plan will be quite precise. Your main challenge will be to remain focused on the effort and not let your mind interfere with doing (taking action). In contrast, for on-sight climbing, your plan will be quite incomplete and sometimes simply incorrect. In the next two lessons we will address how to apply this process to redpoints and on-sights.